Roccat's Ryos MK FX is a solid buy but faces some equally stiff competition. The Ryos MK FX tries to woo with a dazzling light show, but its high price makes us hesitant to reach for our wallets. The Roccat Ryos MK FX has taken over the Ryos MK FX as the ultimate keyboard Roccat has to offer. Now updated with RGB lighting, the Ryos MK FX aims to give gamers all the functions they need plus all the bells and whistles. Just like it did for all its predecessors, Roccat plucked the switches from the good ol’ Cherry we know and love. The Roccat Ryos MK FX exclusively uses the Cherry MX Brown, a switch that is widely regarded as the best all-around Cherry switch for gaming and typing. It has a tactile point that’s quieter than the Cherry MX Blue and a light actuation force of 45g. We don’t know if more switch flavors will be added in the future, but they would certainly be welcomed. Cherry MX Brown fairs better than Cherry MX Blue when gaming, especially when we go full woodpecker on the keys. Because there’s no extra housing around the plunger, key press feels smoother and a tad more responsive. There’s no contest when it comes to typing: We wholeheartedly prefer Blue over Brown. With that said, Cherry MX Brown still offers superior tactile feedback compared to its linear siblings. Since the tactile bump isn’t as pronounced as the one on the Cherry MX Blue, it doesn’t feel as satisfying if you don’t press the key beyond the actuation point. The keycaps are well-polished and UV coated for extra resistance against wear. ROCCAT has chosen Cherry over Costar for its stabilizers. They were silent and didn’t slow us down in the heat of the game. Five easily accessible macro buttons are placed in a separate column. In addition to their primary function, each button can hold a secondary function that can be activated by holding down the EasyShift[+] key (bound to Caps Lock by default). With ten macros at our fingertips, it saved us from doing tons of finger yoga when playing MMOs. If you’re also the owner of a Roccat gaming mouse, the EasyShift[+] key on the keyboard can be used to enable the secondary macros bound on the mouse as well. Three thumb keys are installed under the spacebar to add even more functionality. The usefulness of these buttons is subjective, since users with smaller hands may have to stretch a bit to reach them. If you’re worried about ghosting, save your sweat. You’ll most likely run out of fingers and toes before you hit the 30 key threshold for any ghosting to appear. At 1.6kg (3.5lbs), there’s no doubt that the Ryos MK FX is solidly made. Unfortunately, the glossy strip circling the board makes it look a little cheap. It’s also a magnet for dust and fingerprints: a no-no if you’re a neat freak with greasy hands. The built-in wrist rest is grippy and comfortable, but it takes up a good chunk of space and can’t be detached. While we appreciate the audio and mic pass-throughs, The Ryos MK FX has no USB pass-throughs. We would’ve let this slide (though it would be like sliding a rock off of sandpaper) if the Roccat Ryos MK FX didn’t eat up two USB ports. We’re not even sure what the second port is used for since the keyboard functions just fine with just one plugged in. The lack of dedicated media controls gets on our nerves as well. The Roccat Swarm driver doesn’t present the settings in the cleanest manner, but it passes muster. It features a robust macro manager and lighting customization panel that saves all the settings on the keyboard itself instead of the driver. It’s a useful feature for on-the-go gamers, but you’d need a sizeable pack to lug this giant around. The Roccat Ryos MK FX is one of the few keyboards that uses Cherry’s new translucent switch casing with surface-mount LED. The casing helps scatter light around the root of the switch for richer colors and widen the illumination zone. The new lights are put to good use too. The Ryos MK FX has the most elaborate lighting customization we’ve ever seen. Effect intensity ranges between rave-ready to mellow evening. We especially liked the ripple effect, which sends out a ripple of rainbows across the board at the press of a key. All the advanced effects are handled by the two ARM processors installed onboard. When examining Roccat Ryos MK FX in seclusion, its robust feature set, quality craftsmanship, and eye-watering backlight makes its $170 asking price seem reasonable. 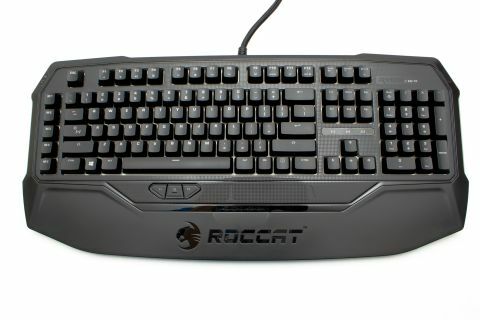 But pit it against some competitors, even some from Roccat, and it quickly loses its shine. For a quick comparison, the Corsair K95 offers more dedicated macros, an all-metal build, and dedicated media keys for $20 more; the Logitech G710+ lacks the headphone pass-through and RGB lighting, but is $40 less; the Roccat Ryos MK Pro trades the RBG lighting for two USB pass-throughs and a $20 discount. That’s not to say the Ryos MK FX isn’t a solid choice. In the end, it all comes down to what you want to spend your money on. If you demand absolute performance and crave the bleeding-edge lighting, then the Roccat Ryos MK FX will more than live up to your expectations. If you’re a purist who pursues function over form, then there are plenty of other fish in the sea.